If you've read our previous VETgirl online veterinary continuing education blog on how to be a more efficient veterinarian, keep reading. At VETgirl, we're all about being more efficient. Why? Because it directly improves work-life balance. The more efficient you are, the better your work hours are. The better your work hours are, the more time you can spend on self-care. With the growing prevalence of suicide in veterinary medicine, VETgirl is very passionate about finding ways that make us all better people, so we can take care of ourselves and our colleagues better. So, in today's VETgirl blog, 5 life changes worth making. You can find additional great tips from a free United Health Care webinar that I recently watched - check out the whole thing here. I've already implemented many of these changes, and feel so much better for it! Do you still have all your veterinary school class notes? Purge them, dude. You don't need them. You haven't looked at them. They are just sitting there making you feel guilty. Honestly, they are so out of date (even if you graduated within the past 5 years), and it's better to have more up-to-date textbooks instead. If you haven't read this book The Life-Changing Magic of Tidying Up , add it to your list now. This is a tiny, short book, so it'll take you less than a few hours to read. While I don't agree with everything in the book, it's definitely helped me downsize. After all, the more cluttered your house, the more cluttered your mind! Free yourself of all that extra crap... like your veterinary school notes! If you're super attached to it, scan it instead. One thing that made me lighten my load tremendously was getting rid of the massive amount of paper in my house. Scan your receipts, vet school notes (if you must), important insurance forms, tax forms, etc. instead. Save it into a cloud-based system (e.g., Dropbox, etc.) so you don't have to have a hard copy of it. My favorite scanner/printer? The Canon MX922 Printer/Scanner . In fact, I scanned about 12 feet (Yes, for real) of paperwork before I moved, to help lighten the load. I'm a firm believer in tithing (e.g., giving away 10% of my salary). Why? Because when it comes down to it, we truly are blessed in life. I still maintained this while I was a broke emergency critical care resident too. Why? Because it helped me mentally feel good about giving back. Don't have the money to donate? Consider donating it in time through volunteerism. Find a local group that you are passionate about (e.g., Ronald McDonald house, feed-the-hungry group, animal shelter, etc.) to give back. I have a rule - no checking email from bed, and no screen time after 9 pm. Why? Because we rarely unplug anymore! 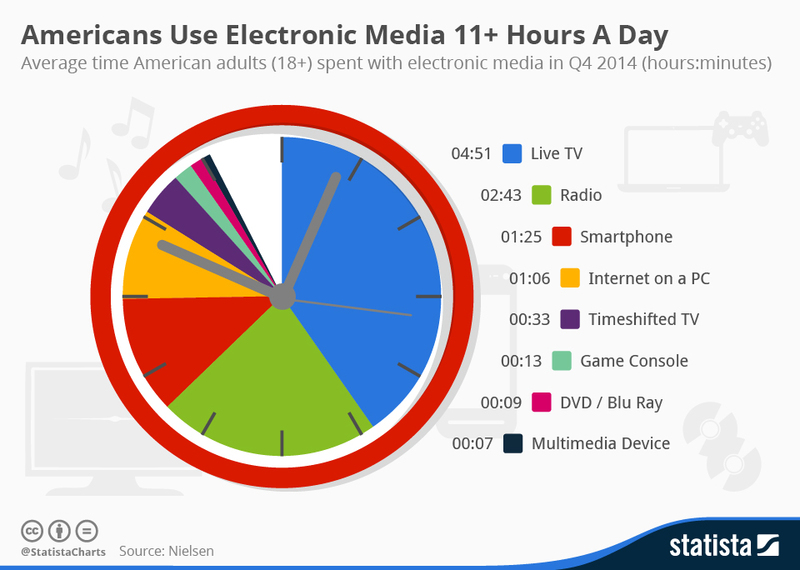 As you can see from the Statista Chart below, the average American spends about 11 hours a day connected to electronics. That's almost 50% of your day, folks! I'm just as guilty of being a neurotic iPhone checker (e.g., did my phone just buzz), but make sure to be able to unplug. A simple start? Leave your phone home while you run errands. Or while you're at dinner with your partner or friends. I detest when people check their phone while I'm talking to them or out for dinner with them, as it comes off as very rude. So take the time to unplug with some very simple rules like above. As veterinary professionals, we're caring and compassionate, right? We feel terrible saying no, like we're letting someone down. Let me fill you in on some advice. You aren't letting anyone down! Someone else will just fill the void if you can't do it! When in doubt, ask yourself two questions when someone asks you something. First, will this spark joy? If the task doesn't directly bring you joy, turn it down. For example, if you're too exhausted to go to that dinner party or that movie with a bunch of colleagues, it's ok to say no! Second, ask yourself "Is this going to directly benefit me?" I'm not trying to promote selfishness here, but we veterinary professionals are so bad at self-care, that we have to increase our self awareness when we are depleting ourselves. Learn to say no. You can always push it off and ask to respond within 24 hours, so you have time to think about it; you'll realize it's a lot easier to say no after a night of sleeping on it. What other hints do you have for awesome life changes that can help improve your veterinary life?